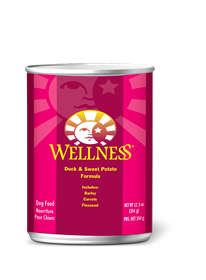 Wellness® Duck & Sweet Potato Recipe is an excellent source of high quality protein and essential fatty acids, made with naturally preserved duck meat. Our high quality deboned duck has been specifically chosen for its lean quality and its powerful nutritional attributes. The sweet potatoes provide your dog with an excellent source of vitamins, minerals and beta-carotene. Duck, Duck Broth, Turkey, Chicken Liver, Whitefish, Ground Barley, Sweet Potatoes, Carrots, Ground Flaxseed, Guar Gum, Carrageenan, Potassium Chloride, Salt, Canola Oil, Iron Proteinate, Zinc Proteinate, Choline Chloride, Vitamin E Supplement, Cobalt Proteinate, Copper Proteinate, Manganese Proteinate, Riboflavin Supplement, Sodium Selenite, Thiamine Mononitrate, Vitamin A Supplement, Vitamin B-12 Supplement, Potassium Iodide, Biotin, Vitamin D-3 Supplement. Adult: Feed 170g for every 3kg of body weight per day. Adult: Feed 354g for every 7kg of body weight per day. For combination feeding, reduce dry by 37g for every 170g of wet food. 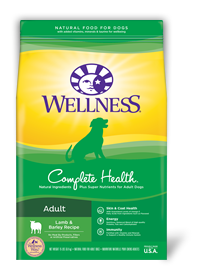 Wellness® Duck & Sweet Potato® Formula Dog Food is formulated to meet the nutritional levels established by the AAFCO Dog Food Nutrient Profile for growth and maintenance.